Since he gave us the creeps, we decided to decline Sameer’s offer to drive us around sightseeing. 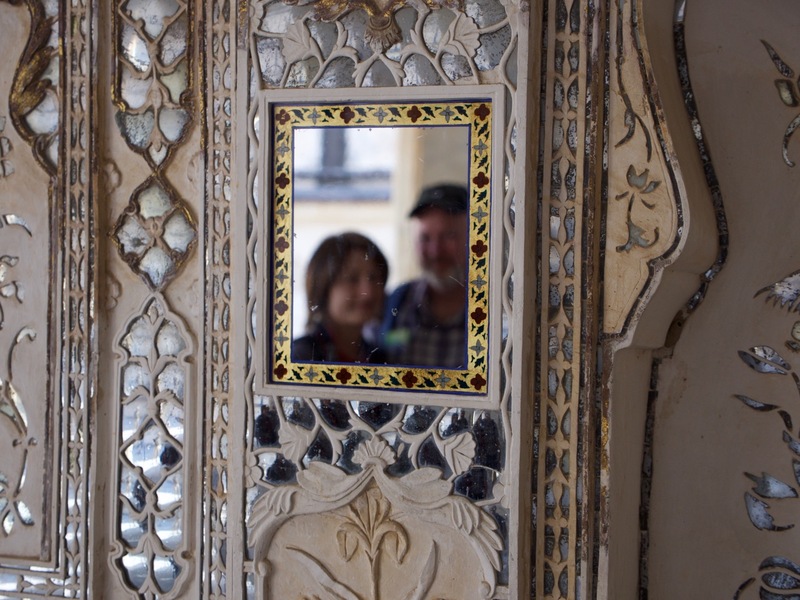 Instead, we found a TripAdvisor listing for a guy named Moin who sounded like the exact opposite – mellow, older, and never pushing tourists to go see things they aren’t interested in. 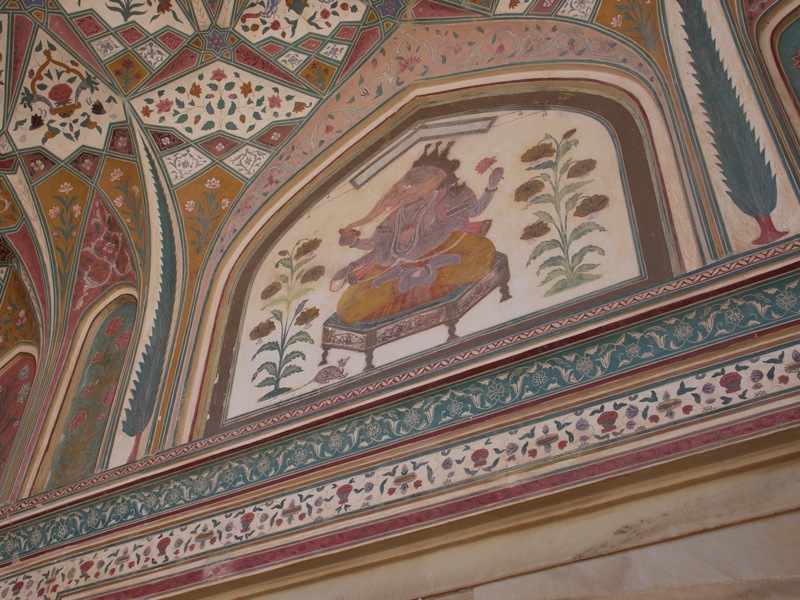 So we hired him for the day on December 15 to take us in his car to the Amber Fort and the Anokhi Museum of Hand Printing, both in Amer, which is a short drive from Jaipur (our home base in Rajasthan). 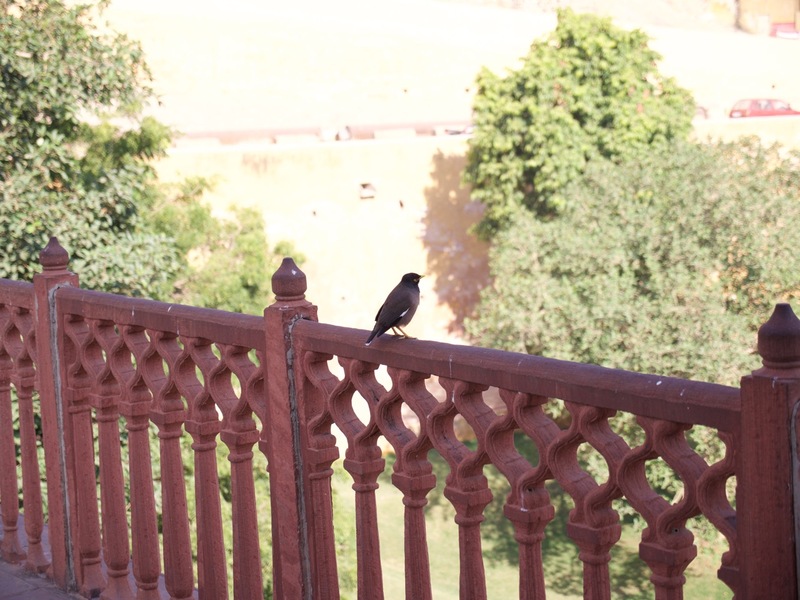 We assumed he would be joining us inside the Amber Fort, so we were surprised when he drove us there, gave us a quick overview, told us how to get in, and then said he’d be waiting here at the car. 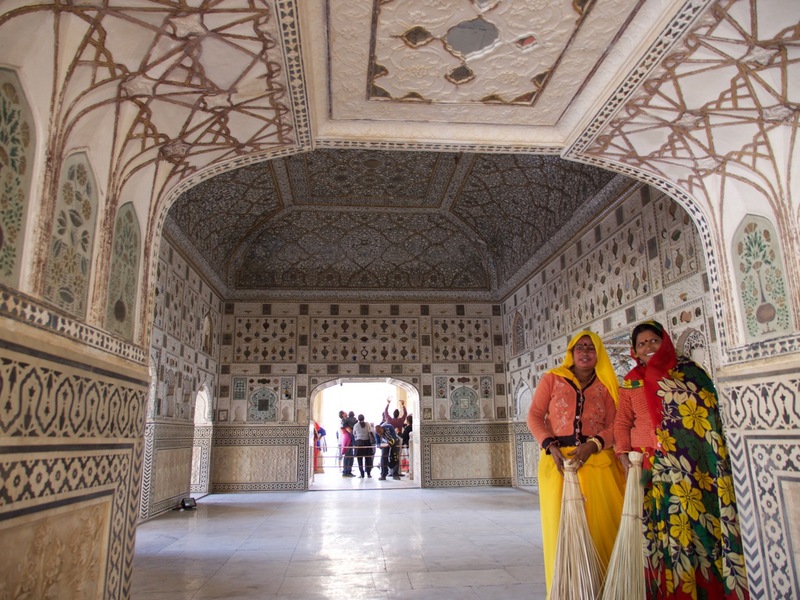 But that’s OK, because we hired a guide inside the fort for pretty cheap. 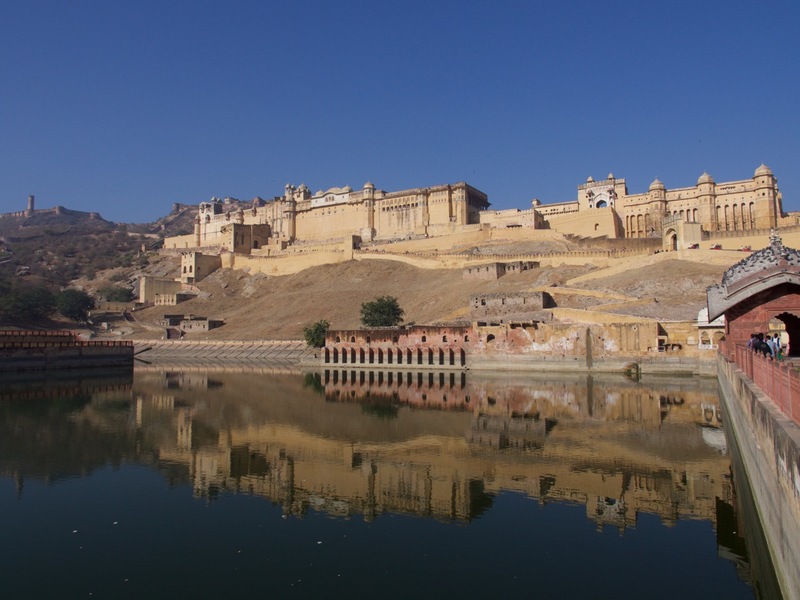 The Amber Fort was built to house the royal family of Rajasthan, after they outgrew their more modest home but before they moved the capital from Amer to Jaipur. 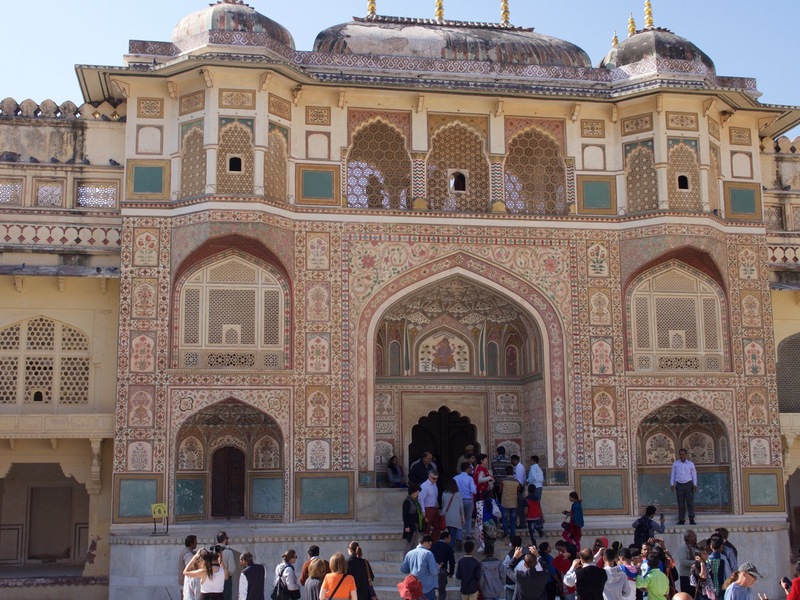 To get into the Amber Fort, also called Amer Fort and Amber Palace, you have to walk up a road with lots of switchbacks, and then enter through a huge gate. 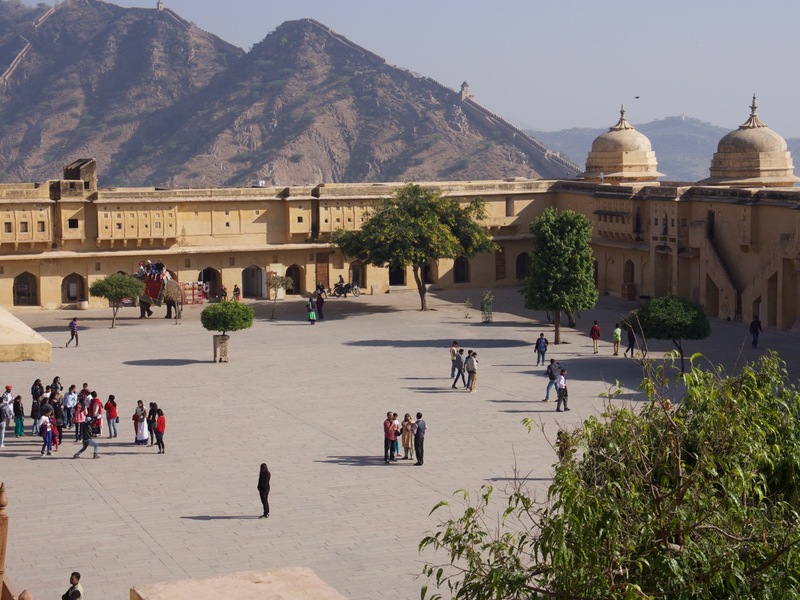 The fort/palace is built on top of a big hill, for security. 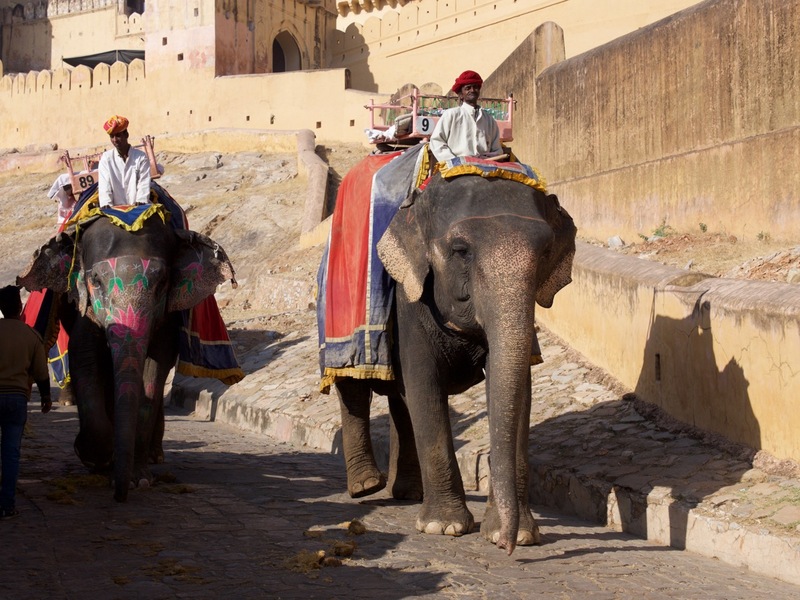 Some tourists opt to ride an elephant up and then walk back down, but Beth and I are sickened by the abuse of elephants and wanted nothing to do with that. So we walked. There are some nice gardens you walk through to get to the path leading up the hill to the fortress. Here is one we could see, but I wasn’t able to find any way to get into it on foot. Maybe they designed it to keep people out on purpose. 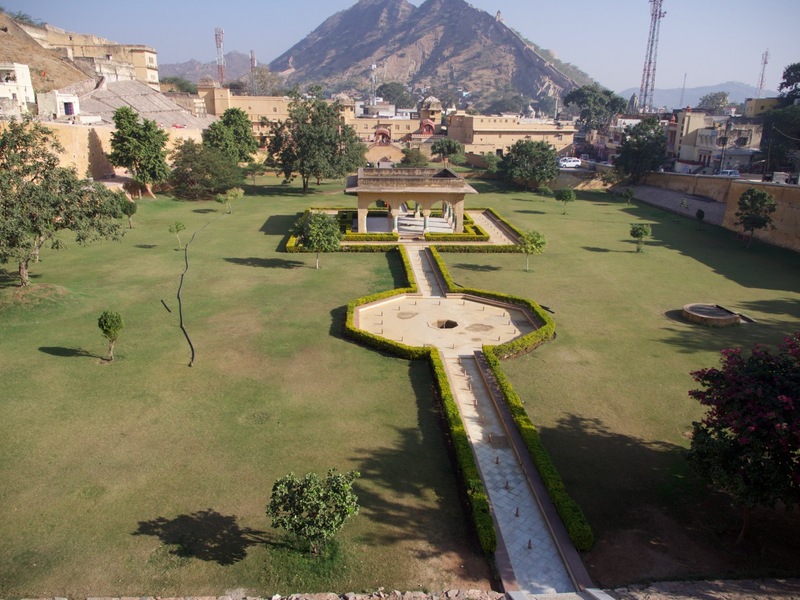 From the gardens you can see the serpentine path leading up the hill to the main entrance to the fort. You’d have to be very determined to attack this place because the guards would be raining missiles on you the whole way up, I think. 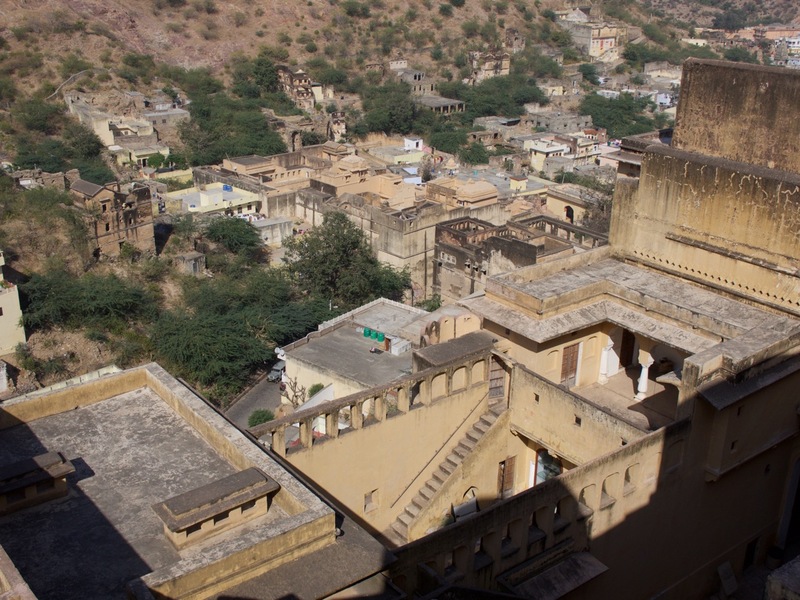 This is the Jaigarh Fort, which was built on an even higher hill overlooking the Amber Palace. 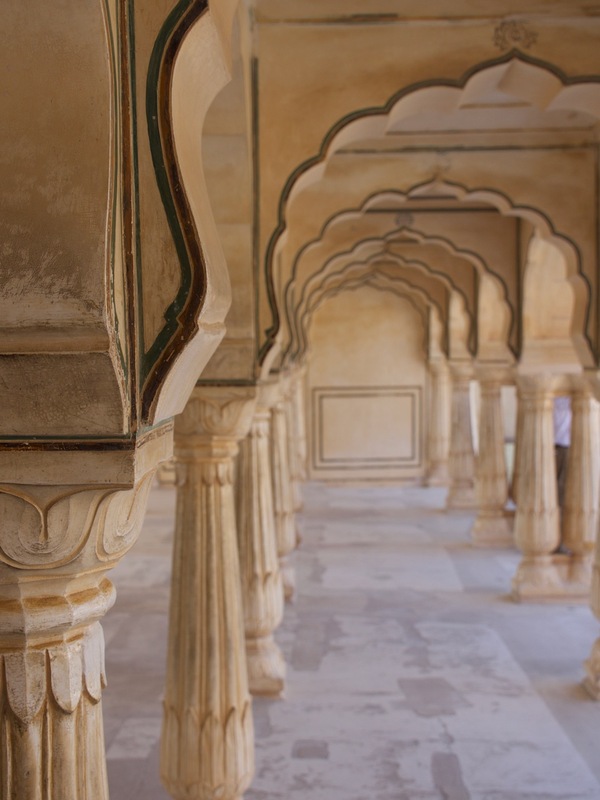 The maharaja built this one to protect the palace, and as a place of refuge in case the palace got overrun. Supposedly the treasury was kept up there somewhere. Also, this fort contains the largest wheeled cannon ever built, so heavy it had to be rotated to point at a target by a team of four elephants. After we climbed up the road to the entrance, we came into this courtyard. Today this is where you buy tickets to get inside, and where people selling souvenirs make a last ditch effort to get you to buy a wooden elephant. Back in the day, this is where the army would parade before the king. The hill in the background reminded me of the area around Glenwood Springs, Colorado, except that it has a huge wall running along the spine as part of the town’s defenses. 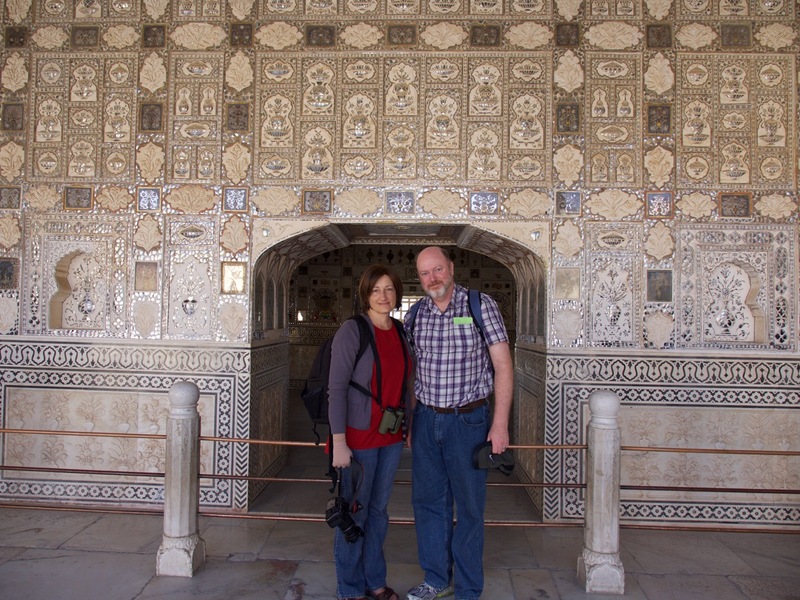 Here I am with Beth from an overlook above the entrance courtyard seen in the previous photo. 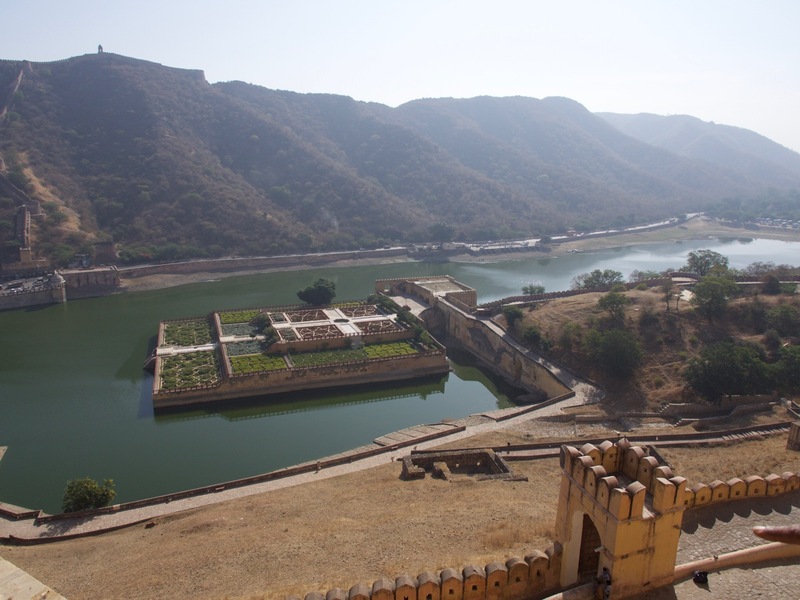 The king who built the fort also had an artificial lake built at the foot of the hill, so that the hot desert wind would cool down before entering the palace. And there’s an artificial island garden built in the lake, too. On all the surrounding hills, there are other fortresses and walls. It seems like Amer was a pretty secure place. 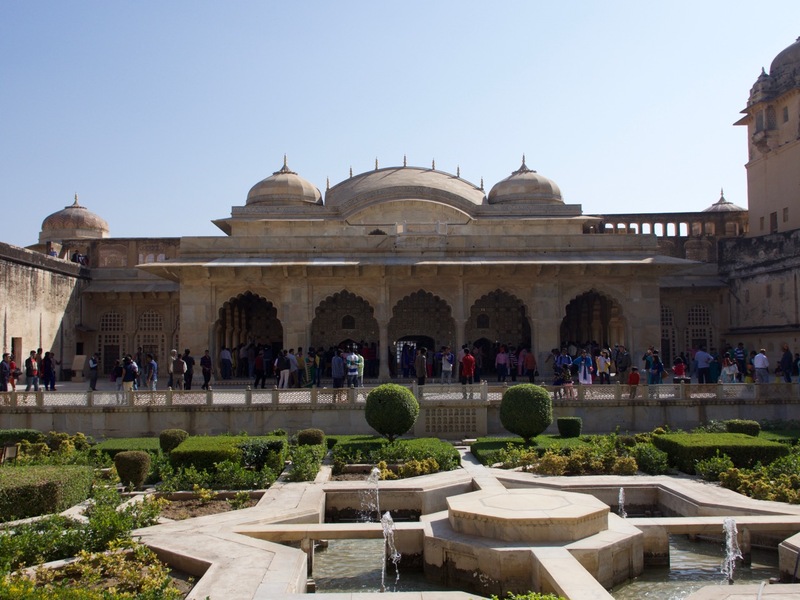 One feature of the complex is the halls where the king (maharaja) would hold audience with either invited guests, or, per tradition, with any member of the public who needed to bring an issue directly to the king. 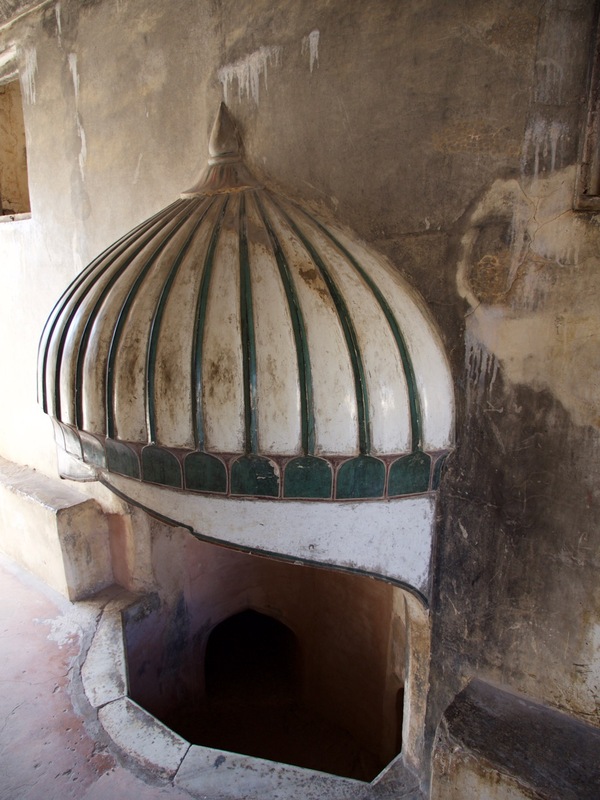 Another cool thing about the fort/palace was the complex Turkish baths they put together. There is one place where the servants would burn wood, and the smoke from that would go up to the outside. But above the fire is a big ceramic tank of water with plumbing feeding in and out. 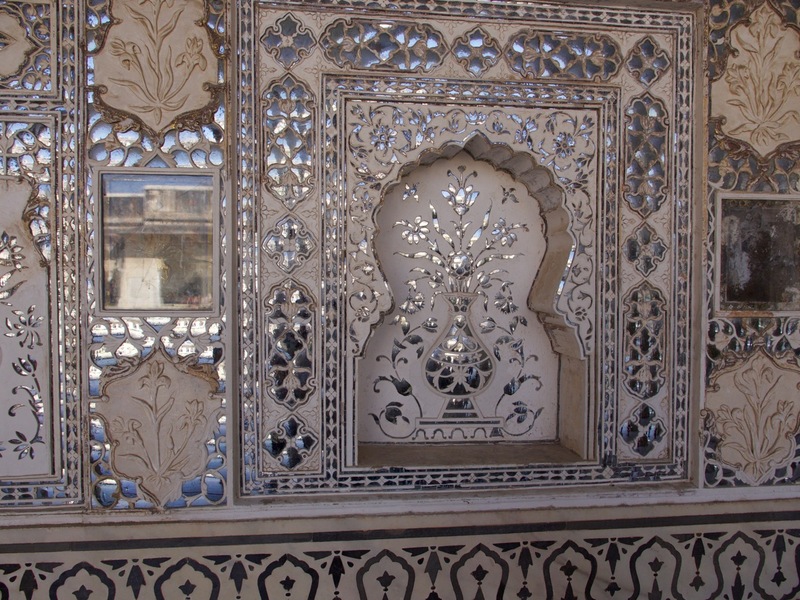 The water in the tank would heat up and then flow out to heat up a steam room before continuing on to a deep bath with seats for the king and whichever women he chose to attend to him that night. 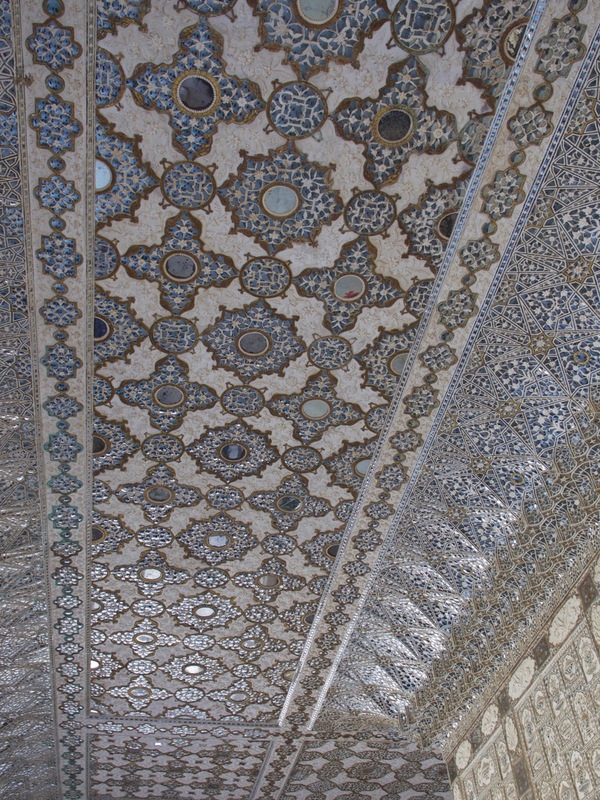 In another area, there is a set of rooms with thousands of small mirrors built into the walls and ceiling. 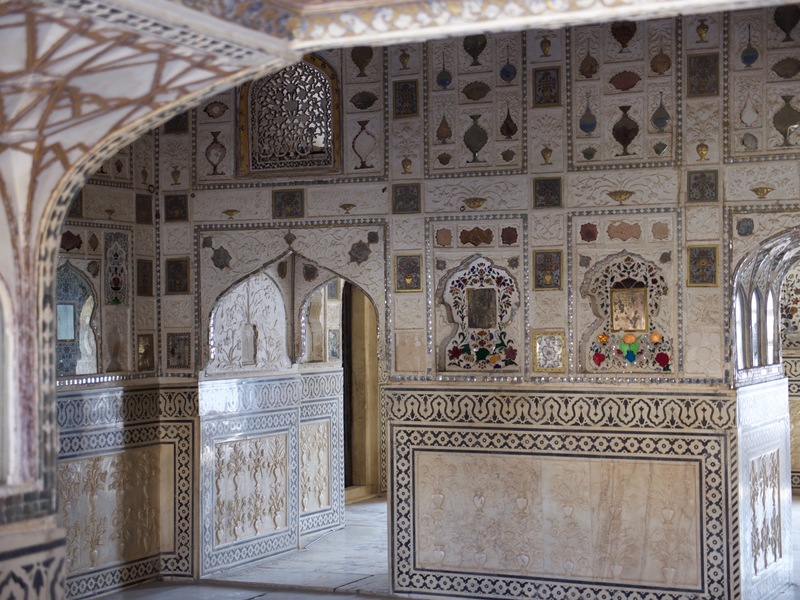 The idea was that the king could make love to one of his wives at night, and the mirrors would reflect the candlelight to look like stars in the sky. Here’s a photo looking down from the palace area into the old town of Amer. 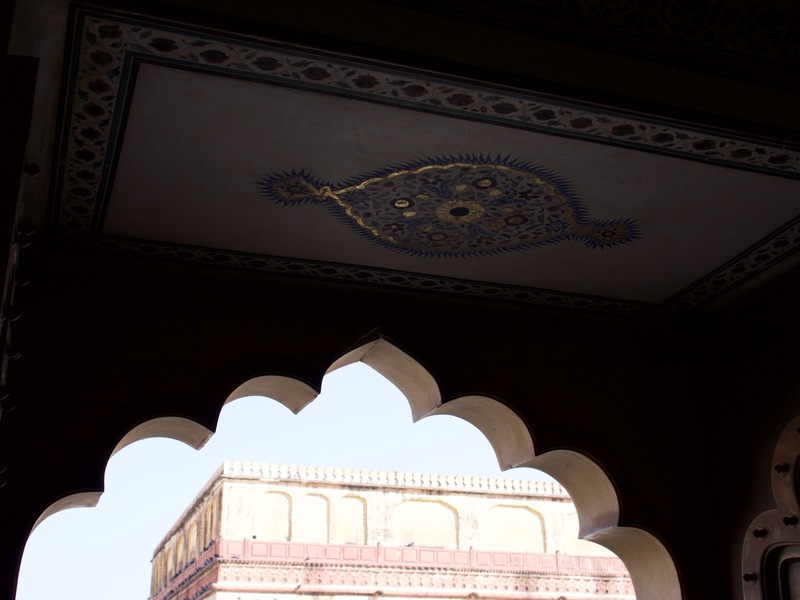 Before the palace was built, the king lived in that building that you can see with the black walls and no roof. It was a much more modest dwelling. But then he got rich and powerful, and apparently attracted enemies. So he moved up the hill. 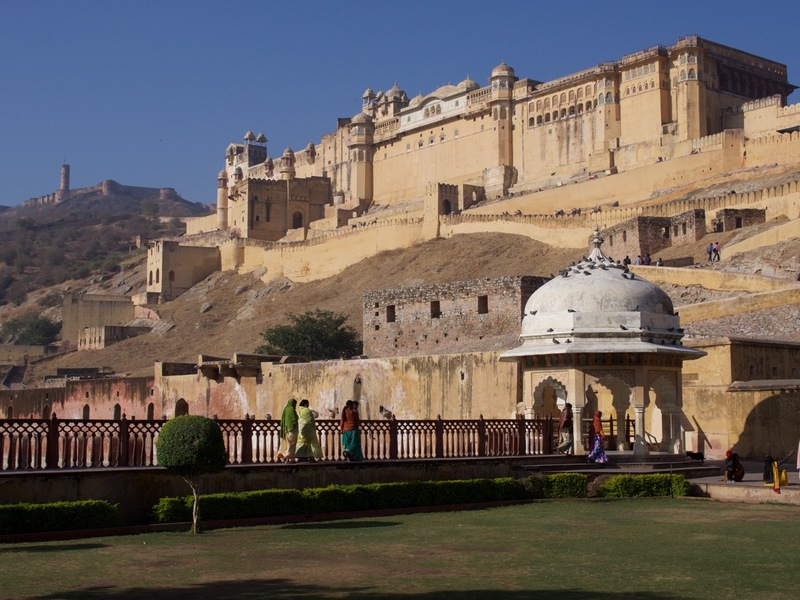 In the foreground are the rooms where the hundred or so concubines lived, on the side of the palace hill. 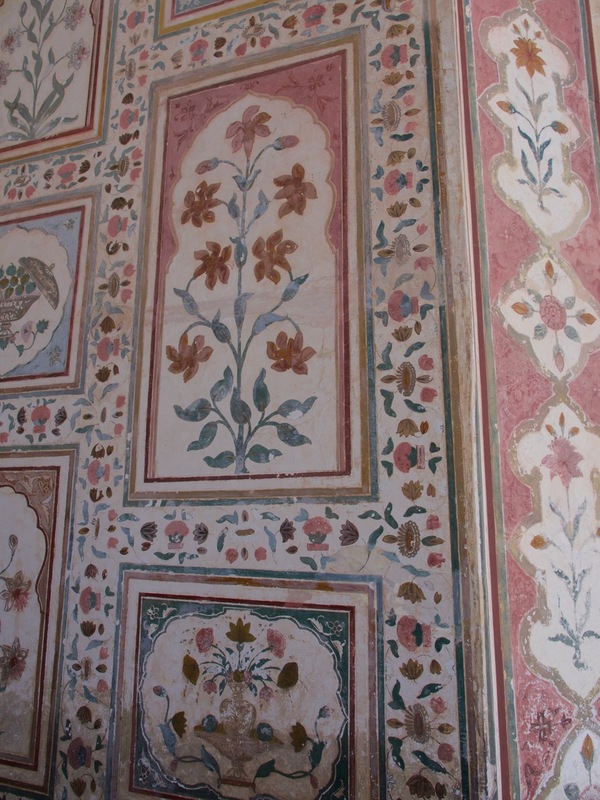 Foreground: concubine quarters. Background: older royal family home. Once we were done with the tour, we walked back down the hill, found the driver, and had him take us to a restaurant for some lunch. 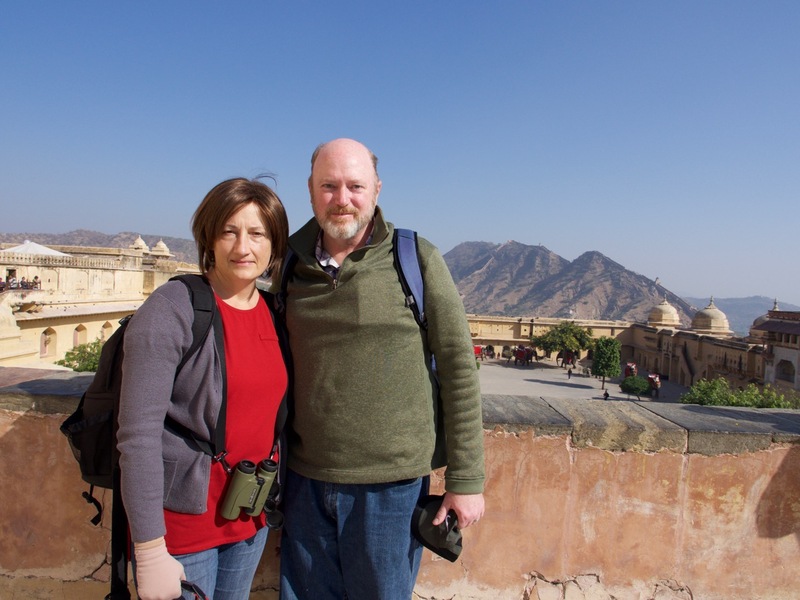 We spent a lot more time at Amber Fort than I expected. After lunch, we went to the hand printing museum. I’ll tell you about that in the next post.